This week is all about Lisbon, Portugal in early to mid June. I have a friend in Porto (you can see my Porto packing list here), it is located north of Lisbon along the coastline. Her photos from there are always epic and leave me more than envious that she gets to live in such a beautiful city. Lisbon is one of the oldest cities in Western Europe, even pre-dating the other huge travel destinations of London, Paris, and even Rome. It is also a massive tourist destination so be ready for crowds, especially as the summer months start to roll in. Pack your walking shoes. Seriously. I know someone who just returned from vacationing there last week and that was the number one thing she said to bring. So. Much. Walking. And not just streets but inclines/hills as well, so bring the comfortable sandals and/or sneakers….or both. It is better to be safe than sorry. Lisbon natives have a style that is effortlessly casual, but still remain chic with an edge. Denim shorts are okay here, and immensely popular unlike some european cities that are more formal. It is also a port city for cruises so you will no doubt see tourists wandering around in swimsuits and a coverup or some kind of similar combinations. Once again avoid the heels, but if you feel you must then stick with a sturdier espadrille style or chunky heel. 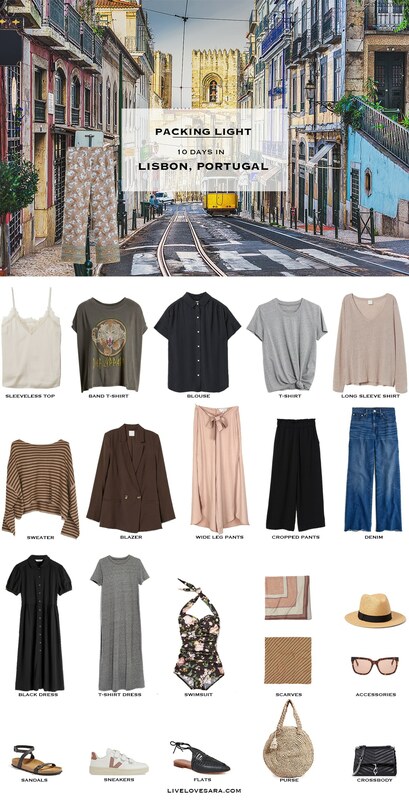 In conclusion, if you are wondering what to pack for Lisbon, Portugal in the spring/summer months I have a packing list with some sample outfit ideas down below. When the weather gets hotter mid-summer a few variations may be needed, and you can easily adapt this to spring by adding a light jacket, and an extra sweater (maybe booties instead of sandals or slides). I used to love on platforms. I not sure what happened. Maybe having kids threw off my balance or something 😉 but I’ve been eyeballing a few pairs recently. Namely a pretty fab red platform sneaker that I saw in a shoe store the other day, I may have to give them a go again.